Here Comes Santa Clause! Here Comes Santa Clause! Somehow, anything festive not only looks better, but tastes better too! 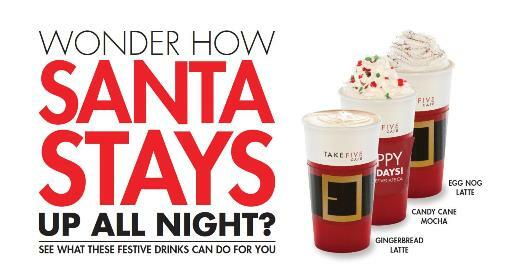 And at Take Five Café we’re giving you many holiday choices to enjoy! Whether it’s the classic Egg Nog Latte, our spin on mint with a Candy Cane Mocha or a traditional ode to gingerbread with our Gingerbread Latte….we have you covered. After all, tis the season to be extra busy and Santa isn’t the only one that may have to stay up all night!